Looking for a touch of luxury for your Las Vegas vacation? The Bellagio might be everything you want and more. The unique Italian-style architecture and dazzling fountain display give the Bellagio a commanding presence even from the outside. The Bellagio is situated between two other mammoth properties, Caesars Palace to the north and the Aria Resort and Casino to the south. Both are conveniently without having to venture outside, which is nice on a scorching summer day. There’s also a walkway bridge to Bally's or the Paris Hotel and Casino on the other side of the Strip. Rooms start at 510 square feet with one King bed. The Resort King rooms have a maximum occupancy of two people while the King Room With Fountain View have a maximum occupancy of three with the same square footage. There are always multiple Cirque du Soleil productions going on in Las Vegas, but "O" is unique because it is the only one where much of the activity takes place underwater! The international cast consists of world-class acrobats, synchronized swimmers, and divers. "O" has been running at the Bellagio seemingly forever, yet it continues to be performed for capacity crowds. This may be one show that will never close! A must-see for every Las Vegas visitor of any age! The show is totally free and perfect for kids of all ages. Covering over 1,000 feet with water shooting as high as 460 feet in the air, over a thousand fountains are choreographed to light and music; everything from Broadway classics to today’s hottest hits. Get ready to sing, dance, and enjoy a truly iconic and uniquely Vegas experience your family can enjoy again and again. Las Vegas may have been built in the middle of a desert, but that doesn't mean it lacks plants! Enjoy 14,000 square feet of colorful vegetation, including colorful flowers and plants, from all over the world! Displays change seasonally with a yearly special for Lunar New Year. Be sure to have your best camera with you so you and your kids will have a permanent memento of this natural paradise. Take your pick of five Mediterranean-style courtyard settings and create the poolside experience of your dreams! The pool complex, Jacuzzis, and picturesque courtyards are open year-round. The Pool Café is open for breakfast and lunch from spring through early fall. Cabanas and daybeds are available for rent. Parents can relax with a poolside massage while kids enjoy the waters. Children 14 and under must be accompanied by a parent or guardian. The pool is open 8:00 AM to 7:00 PM daily. There’s no need to haul your family all the way to France for a little bit of je n'ais se quoi! The observation deck is 46 stories high and features 360-degree city views and with knowledgeable Ambassadors to point out Las Vegas landmarks. Try it at night for glittering city lights! The viewing deck is open daily from 10:00 AM to 1:00 AM. Great for families with older kids! Get the adrenaline rush of a lifetime when you speed down the zipline between the tops of the Rio Hotel’s Masquerade and Ipanema towers. Two at a time, riders soar high and see Las Vegas as never before, at speeds of up to 33 miles per hour. Kids must be 48 inches tall to ride. Escape the heat and get some exercise exploring over 200 shops and restaurants in “Las Vegas’s most exciting mall!” There’s something for all ages here; the shops are largely mid-range in price and include favorites like MAC Cosmetics, LIDS, Urban Outfitters, Houdini’s Magic Shop, and so much more. Take a break and enjoy a tasty bite to eat at Chipotle, Nacho Daddy, Coffee Bean & Tea Leaf, Kitchen Premium Burger Bar, or any other of the 36 food and drink options. The Miracle Mile Shops are open 10:00 AM to 11:00 PM Sunday to Thursday and 10:00 AM to 12:00 AM Friday and Saturday. Get “up close and personal” with your favorite celebrities, brought to life as only the world-famous Madame Tussad artisans can do. The museum features film stars, athletes, musicians, classic characters from fiction, and so much more. Great for a day the family will never forget. Madame Tussad’s Wax Museum opens daily at 10:00 AM. This casual Asian restaurant not only serves a wide variety of noodle soups and dishes, but other traditional dishes from China, Japan, Malaysia, Thailand, and Vietnam. Favorites include Pad Thai, Yaki Udon, fried rice, and more! If you go on Friday, Saturday, or Sunday between 11 AM and 3 PM, you and your family can sample and share a variety of dim sum specials. Noodles is open daily from 11:00 AM to 2:00 AM. This is unfussy American cuisine at its best! Open for breakfast, lunch, and dinner, Sadelle’s has a little bit of everything. Refined grownup palates will appreciate Eggs Benedict and shrimp cocktail, while kids will love Belgian waffles, blueberry pancakes, and burgers. Don’t forget to leave room for a sticky bun ice cream sandwich! Sadelle’s is open daily from 6:00 AM to 12:00 AM. The Bellagio offers a collection of fast-casual they called Quick Eats. Café Gelato offers delicious Italian ice cream along with smoothies, juices, and pastries. Palio Pronto serves gelato, juice, and pastries as well. Palio is a small café where you and your kids can get juice, soup, sandwiches, and pastries. The Quick Eats are open 6:00 AM to 12:30 AM Sunday to Thursday and 6:00 AM to 3:00 AM Friday and Saturday. Bellagio does not offer on-sight childcare. Bellagio participates in MGM’s M Life Rewards program. Members earn points and perks with every dollar spent at participating properties. 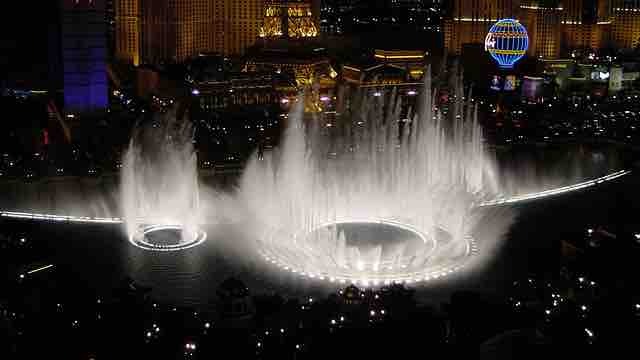 The Bellagio charges a daily $44.22 resort fee that covers internet access, phone calls, and fitness center access. Summing up: Is Bellagio Palace Child-Friendly? If your family has a taste for the finer things, Bellagio will be a great choice! The central location and many amenities are highly desirable, but the cost may be a deterrent for those on a stricter budget.